Author Ryan Levesque talks about ideas from his new book, Ask. He looks at how to understand our audiences more deeply, how to scale that understanding, and how to use that knowledge to serve our customers and clients better. This isn’t a simplistic “formula,” but it is a reproducible strategy that virtually anyone doing business online can implement. I’d love to hear your questions or thoughts on today’s session — or a question for a future Q&A episode of the podcast. Just scroll waaaay down past the transcript and leave your comment! Ryan’s book has just come out — I strongly encourage you to pick it up! You can snag it here. I hope to connect with you in person at Authority Rainmaker! Today, I am having lots of fun. I am talking with my friend Ryan Levesque. Ryan, how are you doing today? Ryan Levesque: Sonia, I’m doing great, and I’m absolutely thrilled to be talking with you. It’s not fun for normal people. It’s fun for weird people like you and me. Ryan, I know you have this bizarre fascination with what makes people buy. Where do you think that comes from? How do you come by that interest? Ryan Levesque: It’s a really interesting question, Sonia, and it’s funny. My answer might seem a little bit unusual, but I’ll explain the reason why I think this is extremely helpful to understand. I said, “It’s really hard for me to answer that ’cause I sat at a different table every single day. “Back in high school, I played saxophone and piano in the band, so some days I’d sit with the band geeks. I was an actor in drama, so sometimes I’d sit with the drama geeks. I was also captain of our high school soccer team, so sometimes I’d sit with the athletes. I was also valedictorian, so I’d sit with the math geeks and the brainiacs and everyone in between. I was kind of a bit of a chameleon I guess. The interest, at the end of the day, if I really think about it, comes down to a fascination around different people and understanding different people’s motivation. I think it stems from the fact that I myself had so many interests growing up that I had a hard time putting myself in a box and was constantly moving or navigating across these different groups. I think when you do that, whether that’s culturally — living in a different country and having to navigate different cultures — or different social groups, it naturally engenders this interest in what motivates these people differently. If I were to go back to the beginning, I think that’s possibly where it comes from. Sonia Simone: That’s very interesting considering your approach to marketing. I love that answer. That’s a cool question, too. I like your copywriter. Sonia Simone: Yeah. Very, very bright. You have this wonderful thing you shared with us about the most-shared words in BuzzFeed headlines, and I would love if you could talk about that insight and what it means. Ryan Levesque: This is most powerful when you can actually see this. I don’t know if there’s a way for us to link to it, perhaps on the show and answer something like that. NOTE: Here’s the Buzzfeed infographic, which comes from this article on Reddit. Sonia Simone: Yeah, sure. Absolutely. Ryan Levesque: BuzzFeed published an infographic, and basically, the infographic is the three-word phrases that generated the most Facebook shares — and this is for last year. 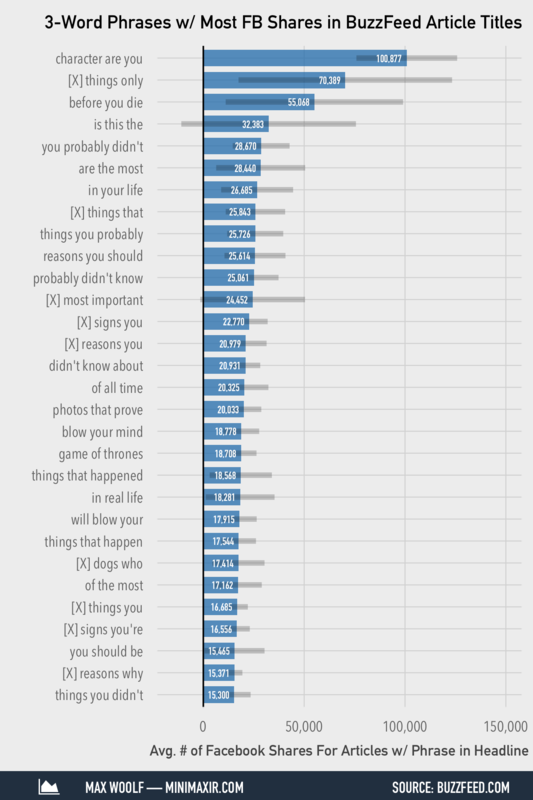 What they did is a linguistic analysis of common three-word phrases that came up over and over again that generated in the most virality, the most sharing. All those different character-you things apparently were wildly successful with BuzzFeed. What’s interesting when you see the infographic is there’s another observation. Not only did it result in the highest average number of shares, but the standard deviation — the worst-performing iteration of that and the best-performing — is a very tight, narrowly focused range, which means that there were no epic failures. It was a pretty slam-dunk strategy. If you just wanted to bet on something, you had a really good shot at succeeding out of the gate if you took that approach. The reason why I think this is so interesting for our conversation is, “Well that’s great,” but unless you are in the business of one of these types of sites, like BuzzFeed, the question I naturally ask myself is, “Well how can I use this in my marketing?” If I’m a small business owner and I sell information products or I’m a small consultant or a service provider, how might I use that same concept in my marketing? What’s interesting is there’s a way to do that very effectively. In fact, as you know, Sonia, it’s what we do in my company and what I do all day, every day. That has me really excited. Sonia Simone: Yeah, and I’m looking at it very closely right now for our business, and I’m thinking of it as the sorting hat from Harry Potter, where they put the hat on your head and they tell you what house you’re going to be in. That idea is powerful — “What house are you in?” –that idea of type. It’s just so powerful, and it’s so complex. The counter-intuitive online formula to discover exactly what your customers want to buy, create a mass of raving fans, and take any business to the next level. Maybe you could tell us a little bit about the book. If I summarize what you’re about, I’m not going to do it justice. Can you talk about the methodology and the ideas in the book? I think this is something that could really revolutionize a lot of different people’s way that they approach their marketing. Ryan Levesque: The best way to describe the book is to break it down down into two main parts. The first part is the story of how I personally stumbled on this formula in its rough form and spent the last decade of my life fine-tuning it and optimizing it to the tune of generating over $100 million in online sales across 23 different markets using this exact formula. The markets are as diverse as golf instruction, tennis instruction, dog training, satellite television, business funding, fitness education, high-end alkaline water systems, water ionization systems, weight-loss supplements, and the list goes on and on. The second half of the book is the how-to. That’s where the formula is laid out, and it’s just put on the line in the pages of the book. You learn about this in the story, that about two and a half years ago, I had a near-death experience where I became very sick. It was right after my first son was born. I lost about 30 pounds, applied for life insurance, and was rejected. We went to go see the doctor to see if the lab results that the life insurance company had pulled up were accurate. It turns out that they were. I was rushed to the emergency room. The doctors basically said, “You should be in a coma right now.” My organs were shutting down. My liver was shutting down. My kidneys were shutting down. My pancreas stopped working. My pancreas doesn’t work effectively today. I spent about 10 days in the ICU. I was between a dialysis patient and a terminally ill cancer patient. It gave me a lot of time to reflect on — I always get emotional when I talk about it — what my legacy was going to be. I made a decision. I said, “This is too valuable to hold close to the vest and only have a small handful of private clients that we’ve effectively implemented this for and which I’ve made a lot of money for, and I’ve made a lot of money for myself.” This is something that the world needs to see because I agree with you, Sonia. I think this is a formula. This is a methodology that can truly revolutionize the way business is conducted online. Ryan Levesque: When you go back to the description that you brought up, I think the three most important things is when people hear a book title like ‘Ask,’ they think, “Well, it must be really as simple as just asking what people want and giving it to them.” That couldn’t be further from the truth. The counter-intuitive aspect of it is asking specific questions, the right questions at the right time to the right people, to find out what it is that people actually want without actually asking that question. The raving fans part is important because one of the things that I think holds a lot of people back in business, especially in marketing, is there’s a feeling that marketing is about manipulation. When you feel like you’re manipulating someone, you can’t invest 100 percent of yourself into it because it feels sleazy. The reason why I bring up the raving fans aspect of it is that this is one of these things that simultaneously benefits you as a business owner, and it benefits consumers. The reason for that is because you’re using the sorting hat, in your language, which I love, to put people in touch with the best-matched solution for them. They win, and you win. The next-level part is important because we’ve used this methodology to scale businesses from six to seven figures, from seven to eight figures, and we even have businesses who are doing nine figures. We have businesses that do upwards of 20,000 leads per day by funneling people through this Ask formula methodology, this sorting hat. We’re asking a series of questions to find out a little bit about their situation, find out a little bit about what they’re struggling with. And then we’re using that information, putting them in different sales paths — whether it’s different sales letters, different email auto-responders sequences, different video sales letters — based on the results of the questions that they answer and then customizing their experience. Sonia Simone: There’s something I like a lot about your approach. I think people see the word ‘formula’ and they think, “You know, this is going to be somebody who’s going to tell me how to make a billion dollars sitting around the house playing Minecraft,” and sadly, no. Maybe if you’re taking client calls when you’re playing Minecraft, I don’t know. It really is a methodology. I mean, it’s work. I want people to know that it’s work. It’s not some kind of paint-by-numbers thing, but it’s a very systematic approach to understanding your audience and then crafting what they really need and want from you. We’ve always been all about that at Copyblogger. I just love that you have taken it and made it very systematic and logical. It’s not paint-by-numbers, but it’s a very solid framework. Ryan Levesque: The thing that led me down this path was that necessity is the mother of invention. Well, this was necessary for me. When I first got started online almost ten years ago now, I failed out of the gate. I was taking the same approach that I had studied, I had taught, which effectively was this one-size-fits-all approach. Out of desperation, I, in the first market that we went into, asked people who were on our list, and I said, “Why have you decided not to buy? Why didn’t you buy?” What I found from that was, when I thought we were speaking to one segment, one group of people, it became apparent that there were really four different groups of people in this particular market. I realized that we were trying to sell them all the same thing and that one thing appealed to none of them because it wasn’t specific enough. We went back to the drawing board — and by the way, this was in a tiny little obscure niche in the “how to make jewelry” space. We were teaching how to make a specific type of jewelry, and it was a business that my wife inspired us to get into because she has a passion in this space. We realized that there were really four distinct groups of people and that when we went back to the drawing board and created four different tutorials, four different sales letters, four different marketing paths by putting people through the sorting hat, the business exploded almost overnight. I realized that there’s something there. I took comfort in the fact that — to your point — that this is work. I said, “The reason why not everybody is doing this — because it’s brain-dead simple — is because it takes time and it takes effort.” But if you do it, it’s the one marketing strategy that I’ve implemented that’s increased results or increased conversion or increased lift every single time. The only downside is that it takes work. I love that. It’s sort of like a little joke about competition, because the truth is, you don’t have to implement this in some kind of perfect, pure, canonical way. The fact is, your competitors won’t do it. They won’t take the time to do it. They’ll look at the book, “Oh, you know. It has a lot of chapters. You know, it has a whole section that says ‘methodology.’ It sounds complicated. I’m just gonna buy some more pay-per-click traffic and just send them to my homepage, or I’m just gonna do the thing everybody does.” It kind of works, so more power to ’em. This is going to take you a little more thinking time and a little more time to do it, but it’s going to put you so far forward. I found that to be the case with content marketing in general. Most people won’t do it, which what makes it awesome. Ryan Levesque: Our older son is three, and his recent obsession is — remember those Disney cartoons from like the ‘20s and ‘30s, The Three Little Pigs? Ryan Levesque: He’s been watching that on repeat. It’s on the top of my mind. As an adult watching them versus being a child, you see all these political messages in there, but it’s a story of three little pigs. We all know that story, right? Really, what you’re doing is, you are the little pig building your house out of bricks. The rest of the world is building their business, their house, out of straw or sticks. When you build your house out of bricks, what happens is this: you effectively built a moat around your business. It becomes very difficult for your competition to storm your castle walls and knock you down because it’s very difficult for the big bad wolf to come in and blow down what you’ve constructed. It takes a little bit more time. That’s the downside. I like to be honest. It takes a little bit more work. I have markets that I’ve been in for almost a decade now, just to provide a frame of reference. We have paid advertising campaigns that we literally have not touched in over five years that continue to profitably generate customers and income for us on a recurring basis. Sonia Simone: I really like that. Something I say about search engine optimization all the time, but it’s really true about any aspect of your business, is, Don’t take shortcuts. They take too long. The short, quick, sure-fire system is usually the one that is going to work for you about 20 minutes and then it’s going to stop working. You and I both see a lot of marketing, a lot of people working on getting the word out about their business. Some people are brilliant. Some people are not. Where do you think most attempts at marketing get it wrong? What do you see as the most consistent mistake or mistake trend? Ryan Levesque: I think one of the biggest ones relevant to our conversation is that people start with the solution in mind. People start, and they say, “I have this great idea. I think people are gonna love it.” The longer you go down that path, the more attached you become to your idea, and it becomes more and more difficult to let go. I think that’s one of the biggest reasons why this formula is so successful and why it’s universal, it’s proven, it’s repeatable and anybody can use it. Again, out of necessity, I had to use it because a lot of the markets that I’ve gone into using this formula, and that the team has implemented, are markets that I don’t have any experience in. For example, the golf market: people are surprised to know that the funnels I have in that market, we generate 10,000-15,000 leads per day, and I don’t even play golf. How do you know how to write copy and build a persuasive funnel and space that you have no idea on? Well, it’s as simple as letting the data guide your direction-taking. When you start with, for example, an open-ended survey asking people, around a specific problem, “What’s the single biggest challenge or struggle you’re having around xyz?” and you take the zen-mind, naïve approach to that, you’re forced to let the data tell you what the answer is. It’s when you come in with preconceived ideas and you say, “You know what? I’ve been in this market for 25 years. I know what it is that people want.” That’s one of the biggest mistakes that people make. Sonia Simone: Yeah, I agree. I call it ‘inventor syndrome,’ where you invented some amazing widget and you’re sure that the world needs it. You spend your whole career trying this thing happen instead of building an audience and then just finding out what they need. I say that like it’s a ‘just,’ but it’s not a ‘just.’ It is a quicker way to get where you want to go. Ryan Levesque: I’ll tackle one more because that one is a big picture, and I think it’s really helpful and really useful. I have one more that I think may blow some people’s minds. The biggest mistake that people make there is they focus on the wrong metric. They focus on frequency of response rather than depth of response. What I mean by that is that frequently asked questions are not necessarily questions that people will pay for a solution to. Perfect example: we have a business in the gardening space. The most frequently asked question that you get in the gardening space, almost without fail is, “How much should I water my plant?” Whatever plant you’re asking about. Teaching a program on how to grow tomatoes? “How often should I water my tomatoes? When should I water them? How often? How much?” Et cetera. The key is depth of response. That might not represent 10 percent of the total responses you get if you asked an open-ended survey around, “What’s the single biggest question you have about your tomato plants?” But that 10 percent is more valuable than the other 90 percent because the passion, the depth of response, is the best indicator you have that that is something people will spend money to solve. Thus, it should direct your product creation efforts. Sonia Simone: I really like that. I think that’s very cool. We could talk a lot about this, but I really want people to pick your book up because we can cover some highlights in a 20-minute interview, but the methodology is pretty deep, and it’s very complete, which I love. I’ve been working my way through the book, and it’s not — like you say — a sales letter for something further. It really gives you the whole thing. You have the whole methodology in the book. If I have calculated this correctly, it should be released tomorrow, April 14th (2015), is that right? Ryan Levesque: That’s correct. If you’re listening to this tonight, it’s currently available for pre-order on Amazon, perhaps BarnesandNoble.com. It’s available, and it releases tomorrow. If you order it today, you will get access to a first edition copy of the book — and this is a physical book. Sonia Simone: Get the book. If any of these ideas are starting to resonate with you or you think, “You know, I think I could do something kind of cool with that,” Just get the book. Other than that, other than picking up the book, if somebody was going to do something in their next 48 hours for their business to get more insight, more clarity, to be moving in a better direction, what do you think they should do? Ryan Levesque: I’m going to make this very tactical because I think it’s most helpful for these things to be very tactical, and I’ll say this. If you have any sort of email marketing that you’re doing, this is a nice little tactic that I like to use. On the first day someone signs up for your email list, they might get an email that offers whatever free thing that you’re giving away — free report or free video, whatever that thing is. Set up your email auto-responder sequence to send a second email, three hours later, ideally — if not, the next day if you can’t send it three hours later. This email should be very short. By the way, if you have a massive business, you can bring in a customer service person to do this. It gives you that survey data. Here’s the third part that most people don’t realize, which is the coolest part. This is the most effective way, at least that I know of, to get your email whitelisted. When you start an ongoing dialogue like this, what happens is the Gmails of the world, they say, “Oh this isn’t a marketing message. This is a personal back-and-forth conversation. We’re gonna permanently put this person in the primary inbox.” It increases all your efforts down the road. It’s super simple to do, super short email. 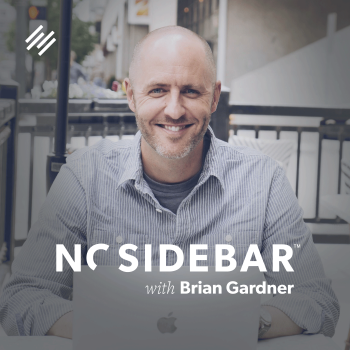 Cue it up today after you listen to this interview, and watch the type of impact that it has. That’s my quick tactical tip. Sonia Simone: I love that. I have actually used a version of that and like it. I can confirm that it works like gangbusters. Very cool. 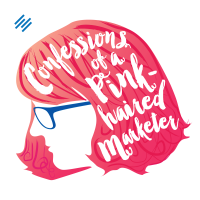 Wrapping this up, the Confessions of a Pink-Haired Marketer have been brought to you today by Authority Rainmaker, a live educational experience that presents a complete effective online marketing strategy that helps you immediately accelerate your business. Do not miss the opportunity to see Dan Pink, Sally Hogshead, punk legend Henry Rollins, and a lot of other very cool smart speakers live. Not to mention the secret sauce of it all, which is building real-world relationships with other attendees. I personally would absolutely love to connect with you there, so I hope you can make it. It’s in Denver, Colorado, this May, and you can grab the details at rainmaker.fm/event. We would love to see you there. Ryan, I just want to thank you. This has been such a fun conversation. I would love to sit here and talk to you for about the next two or three hours about this, but I wanted to whet people’s appetites and really encourage them to go ahead and dig deep into your book. I think it’s going to help a lot of people. Ryan Levesque: Sonia, thank you so much for the opportunity, for the support. It’s been an absolute pleasure, and I look forward to doing it again soon. Sonia Simone: Awesome. Talk to you soon. This is Sonia Simone with the Confessions of a Pink-Haired Marketer. Wow, that was a great show! And what me realy caught was the example from minute 25 on. Glad you enjoyed it, Paula! I really like Ryan’s approach — it blends some good solid tried-and-true knowledge with that twist of the “Sorting Hat” approach to make things more fun/meaningful. Great interview Sonia. Really, really great. The idea of the sorting hat is still kind of bouncing around in my brain and I’ve just implemented Ryan’s advice – about emailing a few hours after people subscribe. I already asked new subscribers about their greatest frustration but with the question embedded in the welcome email, I didn’t get many responses. Breaking it out into a new email – and getting on their white list – is genius. I’ll be watching the results with interest. I also love the idea of creating different marketing streams. I might have to nab his book to see how I can make that work for my shiz. YES! This was great Sonia, thanks for the chat with Ryan. Just pre-ordered Ask, and I can’t wait to get it and dive in. Cheers. I am familiar and have known Ryan a bit for a while now but still learned some new things here. P.S. The Buzzfeed infographic link seems to be busted. Good stuff! Thanks for the heads up on the link, I fixed it. Gotta say, I was pretty pumped after listening to this podcast. In fact, I immediately went out and bought the book. Found it interesting that while Mr. Lavesque states “This isn’t one of those books that’s one of those thinly veiled sales letters…” Actually I found it to be exactly that, “a thinly veiled sales letter” — selling his funnel software, his mastermind group and, once you get hooked, I’m sure, more stuff. Interesting concept, but nothing new you folks at Copyblogger aren’t doing already. You can do better! Thank for posting this–you got me thinking about a new way to solve an old problem in my field: horticulture. Cool cool, can’t wait to see what you come up with!